Gravity Falls is ending. The show hasn’t been cancelled but it’s going to be over in short order. Well, kinda. One more super-sized episode – to be aired at some unspecified date (likely sometime in the new year!?! ), Disney XD was never one for scheduling the show with any consistency – and that’s it. Alex Hirsch, the show’s creator (and, to my mind, genius) said that this was part of his plan from the start, to create a show about one amazing summer among two siblings on the verge of growing up. Summers don’t last forever. Amazing ones are even shorter. Weirder and weirder things have happened to the Pines twins over the course of this summer (spanning 2 television seasons) – gnomes, merpeople, sea monsters, video games coming to life, time travel, body swapping. Pretty much anything Mulder and Scully would have investigated was also investigated by Dipper and Mabel during their stay with Grunkle Stan at the Mystery Shack. The weirdest thing to happen in Gravity Falls by far is “Weirdmageddon”, a semi-apocalypse situated within the town alone, put in motion by the ultimate big bad, Bill Cipher. Bill is a kind of demonic entity or being that looks like the very top of the pyramid on the US dollar bill, with a top hat and bow tie (to keep things classy), and stick arms and legs. Bill has been around for a while now, popping up when the feeling strikes to wreak havoc on the town, after being summoned by Grunkle Stan many years ago. Bill is untouchably powerful and able to change his form, worse than that though he’s whip-smart and a master manipulator. These things combined are frustratingly impossible to defeat. During Weirdmageddon, everything has turned a fire-y orange colour, destruction reigns, a large goat walks the town eating everything in sight and Bill and his cronies (various monsters and demons and other wonkily shaped entities, including a giant head with an arm attached voiced by Louis CK) enjoy a never-ending rave and a throne made of Gravity Falls stone-ified inhabitants in Bill’s “Fearamid”. “Weirdmageddon 2: Escape From Reality”, the second last Gravity Falls episode ever, is the story of a quest and an episode that dares to ask some pretty heavy philosophical questions. Dipper, Soos and Wendy knowingly enter a spherical prison made by Bill to retrieve Mabel, the prisoner. Although Dipper knows that Mabel is upset with him for deciding to take on an internship with Grunkle Ford instead of going back home with her at the end of the summer, he also knows that he needs Mabel’s help to defeat Bill. So, the gang breaks into the prison unknown only to fall down a rainbow and land on a bouncy castle. Through the bouncy castle, the gang enters “Mabel Land” a painfully colourful world made up of everything in Mabel’s imagination and ruled by Mabel. There’s a stuffed animal tree; Mabel’s guards are waffles that regenerate if you eat them (although this also seems to cause them some discomfort); there is a rainbow road; Duck-tective hangs around; there’s even a version of Dipper with a more “supportive attitude” named Dippy Fresh (a sort of Poochie/Dipper hybrid). Mabel Land is a Lisa Frank sticker book on steroids, pumped up to make all colours brighter and all edges rounder. Xyler and Craz (Mabel’s dream boys from the movie Dream Boy High) are there, of course, too, serving as the guides for our not-so-merry gang of three. Xyler and Craz show the gang where Mabel resides, up at the top of a very tall tower, natch. Dipper, Soos and Wendy are all rightfully skeptical of the place because although Mabel’s imagination may have created the things in Mabel Land, the underlying construction is based on Bill’s handiwork. Once they meet up with Mabel at the top of the tower, her pitch to them is that Mabel Land has everything that they, individually, could ever want. And to a certain extent this is true. For Wendy this means the cool kids she pals around with when she’s not hanging with the Mystery Shack gang want her to mess up the school with them and put a plunger on the head of the principal. For Soos this means the dad that abandoned him when he was a little kid will show up looking like a Mexican wrestler and ask Soos to play catch. And for Dipper, this means that Wendy will finally see that the two of them are meant to be together forever. Wendy and Soos are content with their perfect moments, knowing as they do that they aren’t real. Sometimes make believe is just as good as reality and sometimes it’s even better. But Dipper is a different story. Mabel’s imagination has saved the gang, and Dipper specifically, in the past, most gloriously in “Dungeons, Dungeons, And More Dungeons”, where Mabel’s wonderful inner world becomes part of a role-playing game. Gravity Falls is not saying that Mabel’s imagination is bad or nefarious or insidious. We are meant to relish in the joys of Mabel Land. It is easy to see exactly why anyone would want to stay there. But Dipper knows that the real world is hurting and desperate and needs the things that Mabel brings to it. Sometimes it’s easier to put on blinders in the face of tragedy than accept what is going on around you. But Dipper knows this is not the way to get things done. So Dipper dares to break the one rule of Mabel Land. He dares to the question the reality of the place. No, in fact he outright states that the digs are fake. And this shatters everything. The world is pissed. The waffle guards take Dipper into custody. Dipper pleads to Mabel that there must be another way. 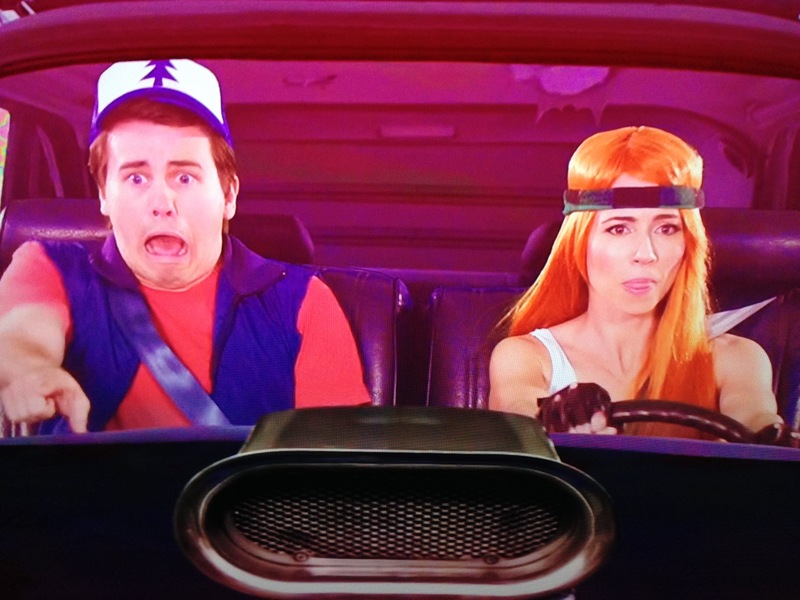 So Dipper goes on trial to prove that the real world has some merits over the fantasy world. If he wins, Mabel will return to reality. If he loses Mabel will stay and Dipper will be replaced by Dippy Fresh. Xyler and Craz defend fantasy, there is a jury made up entirely of Mabels and Judge Kitty Kitty Meow Meow Face-Shwartstein (voiced by John Stewart) presides. Things seem a little stacked against Dipper. In order to prove that fantasy is better than reality we take a tour of Mabel’s scrapbook. On school picture day long ago, some jerk put gum in Mabel’s hair. Why would anyone want to have anything to do with embarrassing or sad or traumatizing moments like this one, these painful moments that we all go through and that we will all continue to go through? The underlying message is that Mabel saves herself and soothes herself through fantasy and imagination and wonder. Imagination is the one way that Mabel knows that life can be better and more fun. Mabel Land is a distillation of all the fun you have as a kid and Mabel desperately wants to hold onto this fun. Mabel does not want to grow up. Growing up means more painful moments like the one in her scrapbook and the distinct possibility of losing her brother. Weirdmageddon is a distillation, too, of all of the pain and “reality” that Mabel doesn’t want to face. Mabel has always been counterbalanced in her beliefs by her twin, the realist, the cynic and the worrier. Dipper does not have the same kind of rich fantasy life to resort to when the real world gets him down. What Dipper knows is this: life is full of crap moments and we might not want to face them and it’s going to be hard and it’s going to be tough. But we can get through these moments. And it is easier to get through them together. Because when life gets Dipper down he knows he has Mabel. Remember that picture day? Well, Dipper was there and although he couldn’t altogether fix things he did make things better for Mabel. Dipper knows that Mabel is scared of growing up but he promises that they will do it together. He promises Mabel that he is not going to take the internship – that was all just a fantasy on his part. Dipper wins and so does reality. The prison sphere bursts. Xyler and Craz escape the prison sphere – somehow – and spend the remainder of the episode quoting Sartre and pondering their existence. The fact that no one is allowed to question the reality of Mabel Land is proof that Mabel knows it is fake too – that underneath all of the rainbows and butterflies and gumdrops lives anxiety and fear. If Mabel Land becomes Mabel’s new reality then all hope for Dipper is lost, because in many ways Mabel is Dipper’s hope. But then there is the quote above. What truly is wrong with a little make believe? What’s wrong with imagining into being exactly what people have always dreamed of? Mabel’s right, isn’t she? Isn’t is a bit troubling that reality wins at the end of the day, fantasy and imagination having done such good for Mabel (and everyone) in the past? In this case, the show seems to be saying that fantasy in a fantastical world is meaningless – imagination only helps in a world of reality. In fact, that’s why Mabel Land only works on people who have entered from the real world, because they’ve been beaten down for so long. But at some point we need to face the music. In the real world sometimes your dad abandons you and sometimes you don’t get the girl and sometimes you don’t get to put a plunger on the principal’s head. But there is good there in the real, within the muck and the grime, sometimes there is laughter and fun and imagination too. And the laughter and fun is more pronounced when you are faced with that muck and grime. And if you are lucky there’s someone next to you, riding shotgun. Gravity Falls was always going to end. As it stands, the summer was already inordinately long – lasting two full seasons of 20 episodes each. Dipper and Mabel already decided to stay longer with Grunkle Stan at the Mystery Shack than they originally planned. And they were happy there. And sometimes sad, too. And they were there together. Fall was always on the horizon, even at the start of the summer, and along with it school and sweaters and then winter and snow. And then a change of calendars. And a little bud on a tree. And then, wouldn’t you know it, you’re already grown. ← The Best Time Ever, is.